Photo by Mike DuBose / United Methodist News Service. Things were proceeding as planned. The annual Good Friday service held across the street from the top-secret nuclear weapons lab had just concluded. Now, as they had for several years in a row, waves of congregants flooded into the intersection to engage in civil disobedience, protesting Lawrence Livermore National Laboratory’s design of 50 percent of the United States’ atomic arsenal. Then I saw something that wasn’t expected: the preacher at our anti-nuclear service that morning, Bishop Leontine Kelly of the United Methodist Church, was wading out into the street with the others. A Methodist minister sidled up to a few of us and explained that the bishop had suddenly decided to risk arrest. I now saw a troupe of church officials — who had come out to this Northern California nuclear weapons facility simply to be with their bishop — scrambling into the street to join her. A few minutes later, she and her ad hoc affinity group of ecclesiastical bureaucrats were whisked away by the local sheriffs. It was the first time that a bishop had been arrested at the lab. Bishop Leontine Turpeau Current Kelly was used to “firsts”— in 1984 she became the first African-American women to be elected bishop by any major Christian denomination. She had begun her career as a high school history teacher and then went on to make history herself. Bishop Kelly died this past week at the age of 92; her life and work will be celebrated today at her funeral in San Francisco. It is very clear why you have to do battle in relation to a church that is going to take measures to cut anybody out and still call itself church. … I think that for us as black people, to be drawn into that kind of complete hatred — and that is what it is, hatred — violates our own history and the way God has worked with us. The Central Jurisdiction was dissolved in 1968, but only after numerous nonviolent battles. 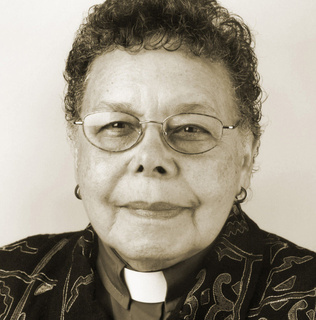 Leontine Kelly rooted her support for a radically inclusive church and society in her experience of the long-term struggle for justice, something that was vividly brought home to her as she grew up in Cincinnati where her mother founded a chapter of the Urban League and the parsonage where her family lived had been a station on the Underground Railroad. For Leontine Kelly, this community extended globally. In 1995, on the 50th anniversary of the atomic bombings of Hiroshima and Nagasaki, Bishop Kelly joined hundreds of peace advocates at the Nevada Test Site to renew the call for an end to the proliferation of nuclear weapons. As one of those who joined her in that August heat, I continue to be moved by the way she carried on her nonviolent battles for the well-being of all. Thank you, Ken, for this tribute. I remember Bishop Kelly for the many times she stood up for the people of El Salvador and Guatemala as they suffered or fled repression in their home countries. She was a courageous leader ready to speak on behalf of the voiceless while finding ways to enable them to speak for themselves.